PHUKET: A partner in the Kajonkiet kindergarten in Pa Khlok was shot dead at 10:15 this morning (October 12) in front of the school. 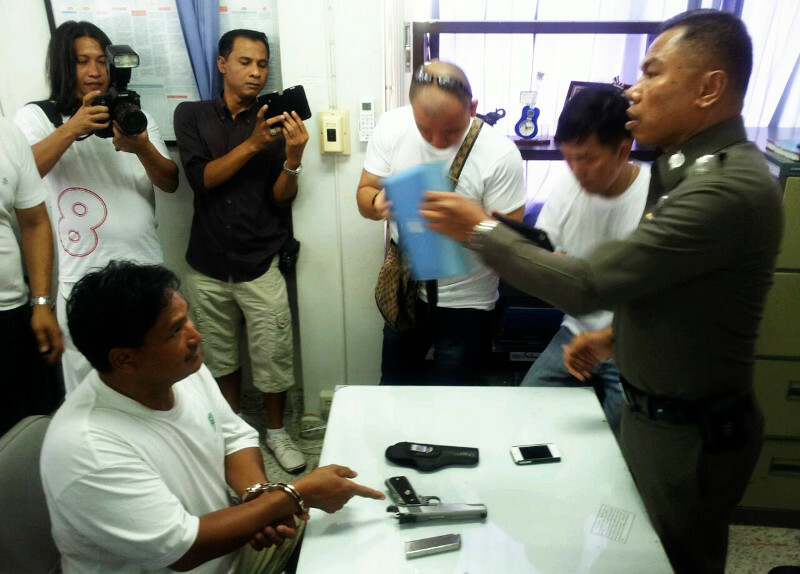 Pairoth, seated in Thalang Police Station, with his gun. Khamnun Seangwanloi, 49, was shot with a 9 mm gun wielded by Pairoth Somphet, 48, from Pa Khlok. He was arrested within the hour. He told police that Mr Khamnun often looked down on him, argued with him and had threatened him many times. Finally, they had a blazing row about construction dust from renovations that was infiltrating Pairoth’s house. As Mr Khamnun walked away to check on construction progress, the infuriated Pairoth ran back to his house, took his gun and shot Mr Khamnun five times, killing him instantly. Pairoth is in Thalang Police Station, where he has been charged with murder.